Mercury, as is evident by both his finger and mount, and sportspeople with these qualities are not just mentally dexterous, they are have amazingly skillful and nimble bodies. Mercury gives him craftiness as well. In fact no one will really know what Raefal Nadal is thinking. He is not what he seems. Check out his hand photograph here. His innate cautiousness is shown by the start of his head and life lines and confirmed by his thumb. These signs tell us that Nadal keeps his cards close to his chest. He is also inwardly calm (Mars) and this enables him to take the right decisions with a cool head. This makes him a dangerous opponent. He thinks on this feet, and can therefore outwit his opponent. He is not as aggressive as some other tennis players, certainly not as aggressive as Federer, but he doesn’t need to be. He has own game plan, which is usually flexible. And one needs to add, a plan which may not be quite straightforward. This is not to say that Raefal Nadal isn’t a gentleman. He is a refined person, kind-hearted and charming, and this is shown by the texture of his skin, his Mount of Venus, as well as his thumb. His talent for uttering the right words at the right time (Mercury, thumb) can make him everyone’s favourite. 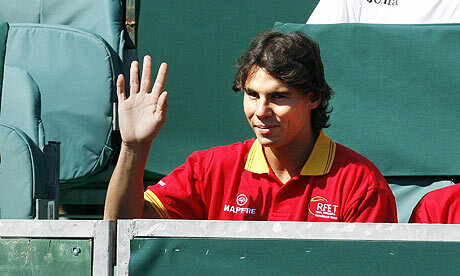 The placement of Nadal's fingers show that he is different, or rather, individualistic. His thinking and his actions stand out. This is partly because he tends to think out of the box and does not follow the herd. Moreover, he does what he likes, and at times breaks the rules of society. But he does what he feels is right. His thumb reveals his strong will power and determination, persistence and stubbornness. He isn't the type to give up easily. What is it that drives him? It's certainly not money. His Jupiter (conic, long first phalange) gives him a streak of idealism and righteousness which is not contradicted by any other sign. He wants to always do the right thing, and can be critical and judgmental of those whose behaviour he doesn't approve of. He has to be careful that he doesn't become a hypocrite as not all the things he does are absolutely correct. He is likely to have a great love for his country. He wants to be the best in his field, and wants to keep improving his game. Although he has good self-esteem, he genuinely feels that to be the best he needs to keep learning. He has his heroes and looks up to them. He will be critical of himself because he wants to improve. He is very far-sighted and prudent in this regard. His fingers show that he is not consumed with neatness in his physical surroundings and may not always take care about his appearance. He is too engrossed in his daily tasks and finds these aspects of life cumbersome. His good finger of Apollo as well as his fingers overall tell us that he is a spontaneous and fun-loving guy, likes beautiful things, and is in fact quite dashing and flamboyant. What makes him so is his boldness in expressing his personality. Several signs confirm this reading - the way he holds his fingers as well as their length. Overall Raefal Nadal is not the kind of person you can take lightly. He always has something up his sleeve. Related Reading: Find out what makes Roger Federer tick by reading his hand analysis. If you like football stars, you can read about Cristiano Ronaldo, and if you like cricket stars here is the hand analysis of Sachin Tendulkar and Saurav Ganguly. Yeah,this guy is unique and a bit of a mystery as well. I have never seen him play as I don't watch tennis but I have not even heard much about him from some tennis fans who I know well. At least about Federer there is so much that people say! very interesting. so who would you prefer personally, roger federer or nadal? I can give you an objective opinion as I do not care for tennis and have not watched these people play. As people, I prefer Federer! Anyday! Federer is a real sweetheart, all soft and sweet inside, and I love people like that! Also Federer is more straightforward and I like people like that! His head and heart lines starting together show that he is a cautious person. His not being aggressive tallies with this but not him being his own man. Well, the lines together do not contradict the independent thinking. Yes if the lines are close together for a longish time they could show being protected in early life (needs to be collaborated by beginning of fate line) and therefore dependent thinking, but this reading does not hold in adulthood. Yes, they do show cautiousness but my reading is not from this sign but from the way he holds his fingers. The photograph that I may use here may not always show it, because I tend to check at least 25 photographs before making the judgment. Thanks, it's always great discussing these palmistry points with you! However these studies do not go into the complexity of the issue. Each finger stands for certain personality characterstics and by this I mean a group of characteristics. If fingers are of normal length then the personality is in balance. If not, there is a slight imbalance which may not always be a bad thing. A long ring finger gives the person more of the characteristics of the ring finger but these have to be read in conjuction with the Mount under the finger, whether the apex is centred or leaning, whether the finger is straight, bent, leaning or twisted, on what kind of hand these characteristics are found (intellectual or labourer or business type for eg) and whether other signs collaborate the signs that the long index finger (as compared to the ring finger) signifies. You see, palmistry is a very complex thing and to be accurate you can never provide simplistic answers, which unfortunately research tends to do.